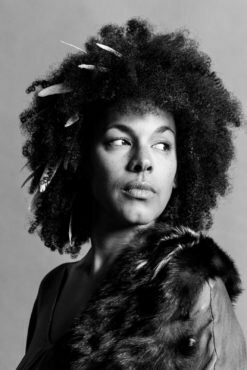 Valerie June headlines PLAYlist, Durham Central Park’s free, annual concert series! “Valerie June perfected her handsomely idiosyncratic brand of Americana on this second LP, steeped deep in electric blues and old-time folk, gilded in country twang and gospel yearning. The press-repeat standout is “Astral Plane,” with its woozy reverb and disarmingly tender, flying-on-the-ground vocals. “Shakedown” is an impressionist juke-joint party jam. But the headiest moments are “If And,” which taps into Tuareg styles to map African sounds from old world, to new, then ’round again; and “Got Soul,” a matter-of-fact re-braiding of Southern musical history with banjo, fiddle and Stax/Volt brass. Who knew musicology could feel so good?” — Rolling Stone. “Cosmic Americana” artist Kamara Thomas opens the evening.